High efficiency and compact single-phase inverters are desirable in many applications such as solar energy harvesting and electric vehicle chargers. 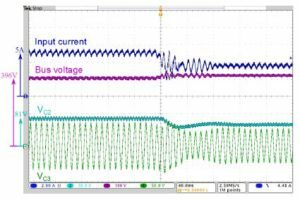 This paper presents a 2 kW, 60 Hz, 450 VDC to 240 VAC power inverter, designed and tested subject to the specifications of the Google/IEEE Little Box Challenge. The inverter features a 7-level flying capacitor multilevel converter, with low-voltage GaN switches operating at 120 kHz. The inverter also includes an active buffer for twice-line-frequency power pulsation decoupling, which reduces the required capacitance by a factor of eight compared to conventional passive decoupling capacitors, while maintaining an efficiency above 99%. The inverter prototype is a self-contained box that achieves a high power density of 216 W/in3 and a peak overall efficiency of 97.6% while meeting the constraints including input current ripple, load transient, thermal and FCC Class B EMC specifications. Fig. 1. Full system overview of the single-phase inverter. Fig. 2. 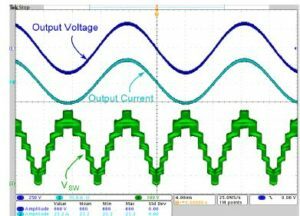 Waveforms showing active energy buffer operation at 2kW. Voltage ripple on VC3 counters the ripple on VC1 so that the bus voltage is constant. Fig. 3. Waveforms showing the output voltage, output current and the switching node voltage (VSW) of the 7-level inverter at full load. Fig. 4. Capacitor voltages of the 7-level inverter during full load operation, obtained using National Instruments data acquisition system (PXIe-1073). Fig. 5. Energy buffer operation during a load step-down from 100% to 75%. The input current ripple becomes within specifications after 80 ms. Fig. 6. 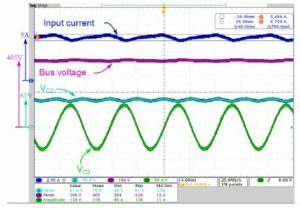 Inverter operation during a load step-down from 100% to 75%. Fig. 7. Conducted EMI measurement at full power (2kW) from 150 kHz to 30 MHz, obtained using Tektronix RSA5126A real-time signal analyzer. 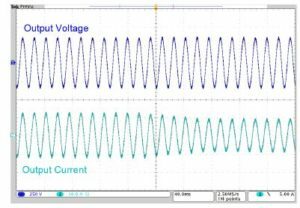 This paper has presented a 2 kW, 450 VDC to 240 VRMS single-phase inverter. 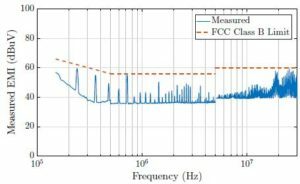 The dc to ac conversion is accomplished through a 7-level flying-capacitor multilevel converter, with GaN transistors switching at 120 kHz, which is the highest switching frequency achieved to date for a 7-level implementation. The commutation loop in the FCML converter is identified, and a switching cell design is used to minimize loop inductance and reduce the drain-source voltage ringing. In addition, the multilevel inverter is complemented by a series stacked buffer converter for twice-line-frequency ripple compensation. The active energy buffer achieves a high efficiency of 99% while reducing the required capacitor volume by a factor of eight. The combined inverter prototype successfully demonstrated a 216 W/in3 power density with a rectangular volume of 9.26 in3. A peak overall efficiency of 97.6% is achieved, including the power losses from control and cooling fan. The prototype meets all the specifications of the Google/IEEE Little Box Challenge, such as the current ripple, the load transient, the EMC and case temperature requirement, showcasing the capability of the multilevel converter design and the series stacked active energy buffer. W. Kolar, U. Drofenik, J. Biela, M. L. Heldwein, H. Ertl, T. Friedli, and S. D. Round, “Pwm converter power density barriers,” in Power Conversion Conference – Nagoya, 2007. PCC ’07, pp. P–9–P–29, April 2007. Meynard and H. Foch, “Multi-level conversion: high voltage choppers and voltage-source inverters,” in Power Electronics Specialists Conference, 1992. PESC ’92 Record., 23rd Annual IEEE, pp. 397–403 vol.1, Jun 1992. Allebrod, R. Hamerski, and R. Marquardt, “New transformerless, scalable modular multilevel converters for hvdc-transmission,” in Power Electronics Specialists Conference, 2008. PESC 2008. IEEE, pp. 174– 179, June 2008. 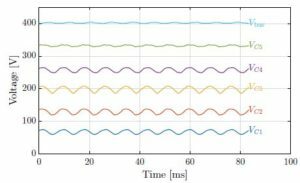 Antonopoulos, L. A¨ ngquist, S. Norrga, K. Ilves, L. Harnefors, and H. P. Nee, “Modular multilevel converter ac motor drives with constant torque from zero to nominal speed,” IEEE Transactions on Industry Applications, vol. 50, pp. 1982–1993, May 2014. Debnath, J. Qin, B. Bahrani, M. Saeedifard, and P. Barbosa, “Operation, control, and applications of the modular multilevel converter: A review,” IEEE Transactions on Power Electronics, vol. 30, pp. 37–53, Jan 2015. This entry was posted in Blog and tagged 2016/2017 IEEE electrical projects for BTech/MTech, Academic electrical projects for BTech/MTech, B.Tech Final Year Projects, B.Tech Projects, best EEE projects, BTech/MTech electrical projcts, Final year electrical projects for BTech/MTech, IEEE electrical projects for BTech/MTech, IEEE Power Electronics and Drives Projects, IEEE Power Electronics Projects, IEEE power System Projects, IEEE Projects, Latest 2016 IEEE Electrical Projects, Latest 2016 IEEE Power Electronics and Drives Projects, Latest 2016 IEEE Power System Projects, latest electrical projects IEEE, M.Tech Final Year Projects, M.Tech Project, Major electrical projects for BTech/MTech, MATLAB/Simulink Electrical Projects, MATLAB/SIMULINK projects for BTech/MTech, mtech power electronics projects for BTech/MTech, mtech power systems projects for BTech/MTech, Readymade electrical projects for BTech/MTech, renewable energy and systems projects for BTech/MTech, topmost ieee electrical projects, wind energy projects for BTech/MTech. Bookmark the permalink.